We are open as usual over the holiday period. 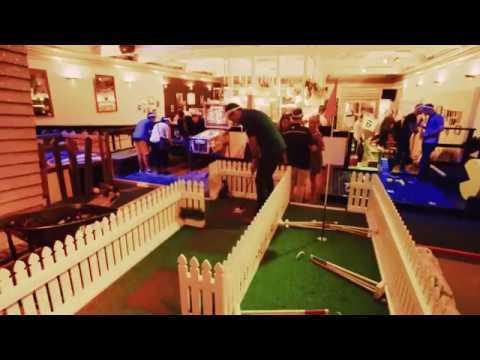 Adelaide, are you ready for a new mini golf experience? We've got nine brand new holes for you to putt your stuff around! Get ready to let your inner Happy Gilmore loose ‘cause these holes are unlike anything you’ve seen before. Yabba dabba do your way through Bedrock as we throw you back to the 90s for a game of Operation. Put your great escape skills to the test with The Great Hole-dini, then make it rain sweet dollary-doos in our cash grab money maker. We’ve really raised the par this time. Can you putt your stuff through our savage box of swords? Make like Harry Hole-dini and mosey your way through our newest magic trick! Get ready to yabba dabba do your thing with the modern stone age family. Putt your way around this prehistoric hole and buckle in for a sweet photo opp. Twist and turn your way through this labyrinth and put your patience to the test. Putt with precision or hit a dead end. This one’s the money maker. Putt your way into a money machine and get a taste for what it’s like to be a Holey Moley millionaire. Op-er-ation. Missed your calling as an open-heart surgeon? Try your luck against this childhood throwback instead. Miss the mark and you’re in for a shock. All day Monday, spend $7 on Food or Drinks and we’ll give you 9 Holes of Mini-Golf for free so you can really putt loose! Head into Holey Moley every Tuesday and if you grab 9 Holes of Mini-Golf, we’ll chuck in another 9 holes all day long. Hows that for generous? Universi-tee off each Wednesday from 5pm, with 9 Holes of Mini-Golf for $8 when you bring your Tertiary ID along. We'll also throw in $5 Beers, Wine and Basic Spirits. Cheers to that! Must show valid Student & Photo ID. We’ve got beers, wines, mocktails, cocktails and snacks to sink your teeth into. Okay, let’s get to the point. What's the deal with alcohol at Holey Moley Adelaide? How do I book at Holey Moley Adelaide? Can I cancel or change my booking for Holey Moley Adelaide? How long does the golf stuff take at Holey Moley Adelaide? What if I wanna bring the whole squad to Holey Moley Adelaide? Got a big group or company party planned? You can book a function for up to 16 people online. If you have more give us a call on 1300 PAR TEE (1300 727 833) or fill in our enquiry form here. Can I bring the kids to Holey Moley Adelaide? Where do I park at Holey Moley Adelaide? The Park Me carpark at 191-207 Pirie St is the best place to drop your buggy. Can I just turn up to Holey Moley Adelaide? How do I get to Holey Moley Adelaide on public transport? Jump on the train and hop off at North Terrace Train Station. The Adelaide public transport journey planner, found here, can map your journey for you! Do I need to bring my ID to Holey Moley Adelaide? If you look under the age of 25, you will need ID to enter the venue after 5pm. We accept Australian Drivers Licenses/Proof of Age cards or International Passports.